این کتاب در آرشیو موجود است. 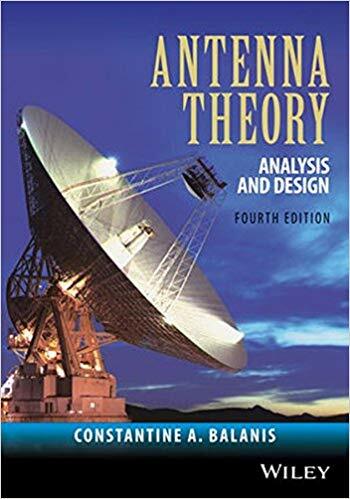 جهت دانلود کتاب Antenna Theory: Analysis and Design 4th Edition با ما مکاتبه کنبد. برای دانلود کتاب تئوری آنتن: تجزیه و تحلیل و طراحی با ما مکاتبه کنید. ایبوک 1118642066در آرشیو گیگاپیپر موجود است. This book introduces the fundamental principles of antenna theory and explains how to apply them to the analysis, design, and measurements of antennas. Due to the variety of methods of analysis and design, and the different antenna structures available, the applications covered in this book are made to some of the most basic and practical antenna configurations. Among these antenna configurations are linear dipoles; loops; arrays; broadband antennas; aperture antennas; horns; microstrip antennas; and reflector antennas. The text contains sufficient mathematical detail to enable undergraduate and beginning graduate students in electrical engineering and physics to follow the flow of analysis and design. Readers should have a basic knowledge of undergraduate electromagnetic theory, including Maxwell’s equations and the wave equation, introductory physics, and differential and integral calculus. Antenna Theory: Analysis and Design, Fourth Edition is designed to meet the needs of senior undergraduate and beginning graduate level students in electrical engineering and physics, as well as practicing engineers and antenna designers. Constantine A. Balanis received his BSEE degree from the Virginia Tech in 1964, his MEE degree from the University of Virginia in 1966, his PhD in Electrical Engineering from The Ohio State University in 1969, and an Honorary Doctorate from the Aristotle University of Thessaloniki in 2004. From 1964 to 1970, he was with the NASA Langley Research Center in Hampton, VA, and from 1970 to 1983, he was with the Department of Electrical Engineering of West Virginia University. In 1983 he joined Arizona State University and is now Regents’ Professor of Electrical Engineering. Dr. Balanis is also a life fellow of the IEEE. فهرست مطالب ایبوک تئوری آنتن : تجزیه و تحلیل و طراحی در ادامه آورده شده است.